One of my main hobbies is playing music. At an early age I took piano lessons, but as I grew older I branched away from the piano and learned other instruments. In elementary and high school I studied the Alto Saxophone for a total of 7 years. At age 13 I got an electric guitar and taught myself how to play it. From there I branched out to lots of other instruments, which I taught myself how to play including the Ukulele, Harmonica, Bass, Melodica, and many others. I’ve never considered myself an expert at any instrument in particular, but I can play many different instruments at a novice level. Having this skill has proven very useful for recording multi-track recordings because it means I can mix and combine the sounds of many different instruments. Around age 16 I started writing and singing my own original songs which I recorded in my bedroom. As I seemed to be writing and recording the songs fairly rapidly, I had the goal of recording a full 12 track solo album (which I wanted to title “One Manned Band on Demand”) before I was finished high school. Sadly I was only able to complete 8 of the tracks by the deadline, and the project has never really been finished. During university, the ukulele became my primary instrument. Inspired by other musicians that I had seen on YouTube, I decided to launch a YouTube channel: cjhoylemusic during the summer of 2009. At the beginning I recorded simple ukulele/voice cover songs, but soon started producing multitrack videos with multiple instruments and vocal harmonies. During my early years on YouTube my viewership grew quite rapidly. 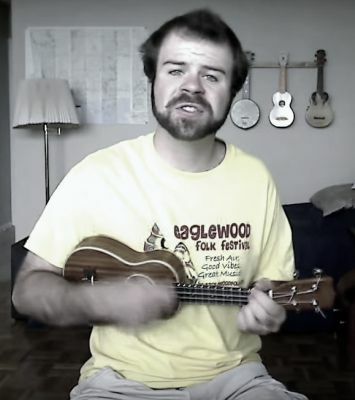 At the time there was a tightly knit community of awesome ukulele players on YouTube that were very supportive of one another. I was involved in several musical collaborations, including one that I organized that features 23 amateur Canadian musicians (Wavin' Flag). As the popularity of the ukulele grew around the world, I began getting involved in ukulele activities offline. Starting in October 2011, I began regularly attending the Corktown Ukulele Jam in Toronto. In the Winter of 2012, during my last term of school at the University of Waterloo, I decided to start my own ukulele group on campus. The group is called Uke W - Ukulele Jam and it took off really quickly. At our very first group jam we had 28 people in attendance! Since finishing university I have continued to create music videos for cjhoylemusic. In the winter of 2013, I opened my cjhoylemusicLIVE channel to share some of my live performances. In the winter of 2015, I built a homemade ukulele.